Credit and praise are due the airliner's staff. That only one person spent the night in hospital and none died is truly remarkable. Put another way, you don't land a Boeing 777 on grass. It just ain't designed for that. 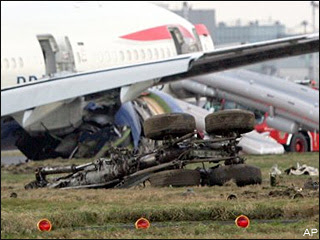 An investigation was underway Friday into how a jet crash landed short of the runway at London Heathrow, injuring 18 people and cancelling more than 200 flights at the world's busiest international airport. Prime Minister Gordon Brown paid tribute to the British Airways airliner's staff and pilot, who drew particular praise throughout Friday morning's British press, for his efforts in landing the plane. The Air Accidents Investigation Branch (AAIB) said an initial report on Thursday's crash would be available within 48 hours, but Chief Inspector of Air Accidents David King warned that it could take more than a month for the full report to be produced. All those on board the plane from Beijing will be questioned by the AAIB, and the airliner's "black box" and cockpit voice recorders will also be checked. Brown, speaking to reporters after landing in Beijing on a diplomatic visit, said it was "right to pay tribute to the calmness and professionalism of the British Airways staff and the captain and what he achieved in landing the plane."